This began as a simple post over the weekend, after I spotted a story on Facebook about Fox News’ recent attack on the Muppets. On Dec 2, Fox business anchor, Eric Bolling was shocked – shocked, he said, that the villain of The Muppets Movie was an oil baron named Tex Richman. Bolling asked his guest, Dan Gainor, if Hollywood was trying to brainwash children. “Absolutely,” said Gainor. “And they’ve been doing it for decades.” Bolling “wondered aloud why the Muppets couldn’t, for once, “have the evil person be the Obama administration” http://www.guardian.co.uk/film/shortcuts/2011/dec/06/muppet-movies-communist-plots-revealed. Silly me! I thought the Muppets were all about friendship and kindness. Now we learn that Fozzie and Gonzo are really Occupy operatives! I guess the 1% need hugs too! The Guardian article, referenced above said, “The discussion…didn’t just typify the Fox News mission to recast the outside world as leftwing propaganda; it threatened to usher in a whole new paradigm of stupid.” My initial post ended by questioning the phrase, “usher in,” since the new era of stupid has been here for a while. “You mean surreality,” my wife replied. In a word, it was yucky. Nothing spontaneous or from the heart – the whole thing was as carefully choreographed as an episode of Glee, but without the humor, (good) music, or fun. I took the dogs out and was ready to call it a night when I heard Kermit’s voice. There he was, part of the festivities, ushering in a new era of political celebrity wars. The whole thing strikes me as sad. I’m really sorry to see Jim Henson’s creations dragged into political nonsense. We’re used to a popular culture of false fronts and illusion, but I always hope our politics will be a little more real than commercials of happy shoppers dancing through K-mart. My hope is that our collective attention-span for news has grown so short that the Muppet foray into politics will soon be forgotten. Let’s hope the PR machinery will roll on and focus on human folly, leaving the Muppets alone to be what they always have been – ambassadors of joy and goodwill, regardless of anyone’s politics. This entry was posted in Characters, Culture, Current Events, Politics and tagged Culture, current events, fictional characters, politics. Bookmark the permalink. Why is there so much need to inject politics into good clean fun like that which the muppets provide? Political discussions are the single most dividing issues that you will ever find. Especially for those who grew up watching them, the muppets should be one of the greatest unifying forces in the world. 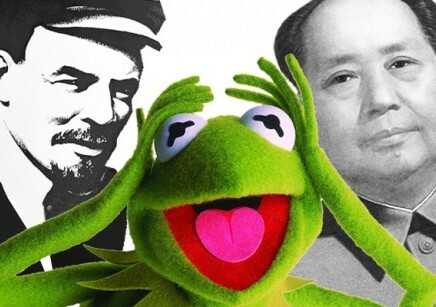 The great irony of Fox painting the Muppets as communist is the poll published in November that found that more Americans (11%) think the nation should become communist than approve of the current congress – 9% then and I suspect that number has dropped a point or two during the past month. I am so sick of politics and the never-ending presidential campaigning that I block as much out as possible. I never watch things like the tree-lighting ceremony because I know it will have a point of view and piss me off. Sorry to hear Kermit got caught up in it. This was my first and last tree lighting ceremony. I wasn’t paying attention when it first came on. I thought of switching to Letterman, but then remembered it was Sunday night. By then, the “This is weird” response had caught me.